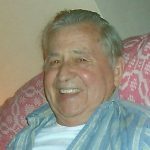 Edward Alexander Germata of the Carverton section of Wyoming, passed away on Thursday, April 4, 2019 at Thomas Jefferson University Hospital in Philadelphia, following a brief illness. He was born in Plains Township, son of the late Stanley and Stella (Jastremski) Germata, Sr. of Plains. Edward graduated from Plains Memorial High School after coming back from tours as a Merchant Marine in WWII, where he served in the military for the United States Navy as a gunner, in the American, Asiatic Pacific, European, African, Middle Eastern, and China Campaigns and also served during the Occupation of Japan. As a teenager he and his brother Stanley Jr. helped the Bernardine Sisters of Reading, Pa at Alvernia. He was employed by Miner-Hillard, in Miners Mills section of Wilkes-Barre, as a Laborer and then worked as a Construction Foreman for Linde Enterprises, the Bectel Corporation and a few other contracting companies before starting his retirement in the late 90’s. Ed was also the owner of the former Ed’s Bait Shop, located in Carverton. He was a member of the Plains American Legion, Joseph E. Conlon, Post 558, the U.S. Navy Armed Guard Veterans of WWII National Organization, and Heavy Highway Laborers Local Union 158. He enjoyed playing musical instruments such as the piano, the guitar, and also had many other activities that he enjoyed especially woodworking and spending time in his yard cutting the grass and listening to music. Throughout his life, he was an avid hunter and fisherman and absolutely loved the outdoors and observing wildlife. He especially loved to go on fishing trips to Canada and most every day, since the beginning of his retirement, you could find Ed at Francis Slocum State Park, where he was a constant observer of the daily fishing activities in the park and wildlife for well over 50 years. He enjoyed many years of fishing and good conversations with his many fishing friends at the park. He had many pets and animals though out his life and especially loved his late pet, “Nipper”. In addition to his parents, he was preceded in death by his brother Stanley Germata Jr. and step son-in-law Michael Timek of Port Blanchard. Surviving are his loving companion, caregiver, and wife Marie A. Germata (formerly Marie A. Schultz) of Carverton, daughter Marie E. Germata of Plains, a stepdaughter Sandra Timek of Port Blanchard and one grandson Brendon Timek of Duryea. Edward’s family would like to thank his primary care physicians and the doctors, nurses and staff at Thomas Jefferson University Hospital for the wonderful care given to Edward during his time in their care. Funeral will be held Tuesday, April 9, 2019 at 9:15 am at the Corcoran Funeral Home, Inc., 20 South Main Street, Plains, PA 18705, with a Mass of Christian Burial at 10:00 am at St. Frances X. Cabrini Church, Mount Olivet Road, Carverton section of Wyoming. Interment with Military Honors accorded by the United States Navy and the Plains American Legion Funeral Honors Detail will be held in Mount Olivet Cemetery, Carverton. Family and friends may call Monday from 2:00 to 4:00 and 6:00 to 8:00 pm at the funeral home. Memorial donations may be made to Blue Chip Farm Animal Refuge, 974 Lockville Road, Dallas, PA 18612, in Ed’s memory.